IPS Correspondent Valentina Ieri interviews the Permanent Deputy Representative of Korea, Choong-Hee Hahn. UNITED NATIONS, Jun 14 2015 (IPS) - In a world where high levels of social and religious intolerance, conflicts, violent extremism and environmental degradation are threatening justice and peace, the United Nations is trying to find ways to maintain world order and promote sustainable development. This year, the drafting of the post-2015 U.N. agenda, which has set up the targets for the next 15 years of Sustainable Development Goals (SDGs), represents a turning point for achieving development worldwide. We need a new system that revitalises the classrooms and contributes substantially to peace and security. Finding a solution to 21st century challenges requires the creation of a fresh, universally-based, inclusive and transformative paradigm. The key to this paradigm is Global Citizenship Education (GCED). Great emphasis has been placed on the role of education since U.N. Secretary-General Ban Ki-moon launched the “Global Education First Initiative”, in 2012, which put GCED as one of its main principles. 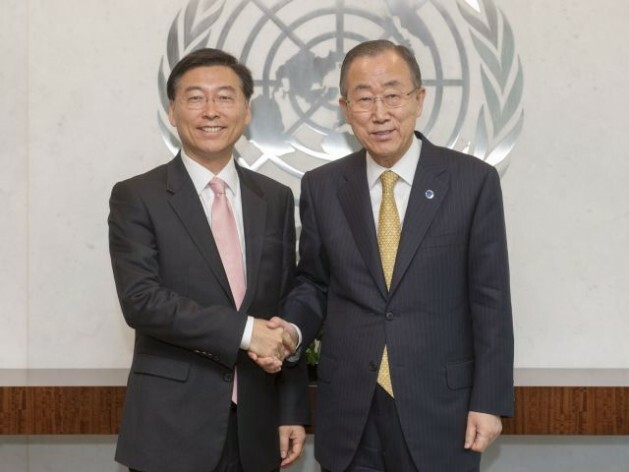 Following the 2015 resolution adopted by the U.N. Educational, Scientific and Cultural Organisation (UNESCO) on the necessity to conceptualise and implement policies concerning global citizenship education, and the adoption of the Incheon Declaration on the Future of Education adopted at the World Education Forum (May 19-22), hosted in Seoul, major steps forward have been made in relation to GCED. Advocates say the next step is to include GCED within the education targets in the SDGs that will be ratified in September in New York. A seminar to raise awareness and spread the concept of GCED will be held on Jun. 15, organised by the Permanent Mission of the Republic of Korea to the U.N., along with the collaboration of the Permanent Missions of the United States, Nigeria, Qatar, France, the UNESCO, international organisations and NGOs. In an interview with IPS, the Permanent Deputy Representative of Korea, Choong-Hee Hahn, spoke about GCED and its relevance for building a more peaceful world. Q: What is Global Citizenship Education? A: Generally, education is defined in functional terms, such as access to schools and quality of education in preparation of a professional career. But the new framework of GCED should focus on orientation. There are three main aspects that GCED should promote. Firstly, the “sense of being”, teaching students, since their early age, about what kind of citizens they should become. They should be sensitised about future challenges, such as climate change, intolerance and violent extremisms. Secondly, the “sense of responsibility and privilege of being a global citizen.” GCED should include multicultural diversity and mutual respect, by understanding the real meaning of fundamental and human rights values, dignity and democracy. Thirdly, “compassion and empathy”. The revolutionary aspect of GCED is its holistic approach to education, rather than advancing to next the level of education or job searching. This is the best approach to cope with our Century complexities. Another important concept of GCED is inclusiveness. Hatred and violence come from a sense of isolation, and a lack interconnectedness. Teaching inclusiveness, embracing different social, political and economic aspects. In this way, people will feel respected and will play an active role tin the society. Q: Why is Korea leading GCED? A: It is because of the rapid development Korea went through in the past decades. Thinking about the history of Korea, we experienced immense poverty. However, by investing in education, and through the promotion of democratic values we reached development. Today, Korea is very multicultural, multiethnic and multi-religious, based on the respect of human rights. Christians, Muslims Confucians and Buddhists live cohesively together. We are a positive example of education, tolerance and peace. As a role model, we would like to contribute and raise awareness on GCED without bias nor prefixed prejudices. Q: Why bringing GCED within the U.N. agenda post-2015 development agenda? A: This is the right time to think about how and why the U.N. is pursuing the new SDGs. The U.N. first priorities are now dignity of people and the planet, along with justice and prosperity. These are value oriented goals and objectives. The U.N. agenda is based on three main pillars: peace and security, sustainable development, and human rights. I think all those issues are intertwined with education, and GCED is the solution to peace and security – by promoting tolerance and responsibility – sustainable development – through inclusiveness and equity – human rights – understanding the privilege of being a human being and democratic values. A: Global education should be based on the participation of multiple stakeholders. Not only teachers and students, but also worldwide social, economic, cultural experts, NGOs and youth groups. GCED should be built on a methodological paradigm, not based on textbooks, but on discussions and participation of all students in the class. New audio-visual methods, and participatory discourses, through fieldwork and exchange programmes. We need a new system that revitalises the classrooms and contributes substantially to peace and security. GCED is not about replicating the paradigm of “Enlightenment and Western” values. On the contrary, by focusing on inclusiveness, it aspires to find a world denominator common to developed and developing countries. However, given that many children still have no access to education, GCED should mobilise funding and concrete means of implementations. GCED should also be participatory and content-sharing. To do so, it is important to develop Information and Communication Technology (ICT) through the use of internet, computers, and mobile phones, even in the remotest areas of the planet, along with the support of the private sector. For instance, in Korea, we are leading several educational projects with private companies such as Samsung . Q: What are the main challenges to GCED? A: Unfortunately there are still huge financial gaps and inequalities among countries. Recently, a proposal for a global fund for education was put forward, but it is not easy, as there are already many other funds, such as funds to finance development or the Green Climate Fund. There is the Global Partnership for Education, the existing global fund which helps developing countries to get access to education for all. However, we need more financial resources, improved capacity building, and more ICT equipment to deploy in developing countries. An additional challenge is the fact that education is not yet perceived as a top priority in many government agendas. This is the real problem. As long as there are not enough investments by local authorities in national education, Global Education will be impossible to achieve. Therefore, it is fundamental the collaboration of the private sector in developing an ethical Corporate Social Responsibility (CSR).